I would like to write that I was full of bliss and excitement when I landed in Bali, Indonesia but instead I was tired and confused. My journal is not full of the observations of the sights and experiences of Bali but rather pages and pages of troubled personal scribbling. The upside though is reading through it I do not remember the angst but I do still remember, even so many years later, my days in Bali. Perhaps because this was my first trip there and the island and Indonesia would become such a large part of my life later on. I found a room at a cheap guesthouse on Jalan Karthika Plaza, not far from Kuta Beach. 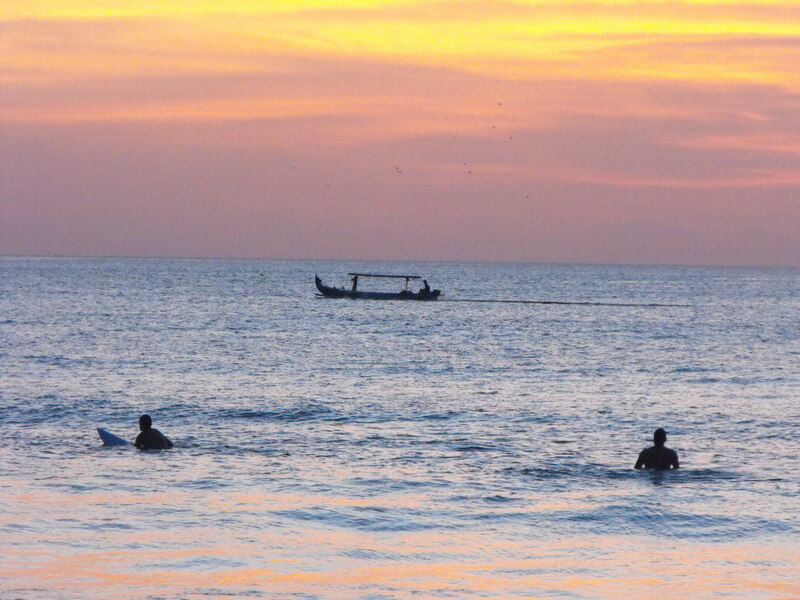 I was determined to relax and take my time in Bali and I proved it right away. Just minutes after checking in I walked into the guesthouse dining area, where each morning they would serve a lovely breakfast of watermelon and buttered toast or a banana jaffle, I found a pet fruit bat. I had never thought myself a fan of bats but then I had never before seen a fruit bat up close and it turns out they are really cute. This one was tame and enjoyed being fed fruit and resembled a tiny German shepherd with wings and clawed hands. Before I could walk five minutes away from the guesthouse two enterprising young women accosted me and insisted I get a manicure and pedicure right there on the street. They had their own plastic stool for me to sit on and small array of nail polish colors. I consented and some thirty minutes later I had one of the worst painted nail jobs ever but by two of the friendliest girls; I felt only amused. Not ten minutes later down the road I stopped to watch a performance of sorts with several men and women in traditional dress and clearly under some kind of trance dance in front of a temple located in the middle of a traffic circle. I stopped and watched for awhile as I had no particular schedule. A few blocks away in a small shopping center very close to the beach I was able to turn away two women who wanted to braid my hair Bo Derek style. I had to draw the line somewhere and I knew I would probably not rock that look. Not long afterwards though it did not take too much convincing for me to agree to a massage on the beach. Initially, as in that first day when I was accepting of all things Bali and drinking it all in, the street side/beach side touts were amusing and dare I say refreshing. Yes I did want my nails done. Yes I did want to sign up for a tour. Yes I would like to eat in your restaurant. Yes I would like a massage. As the days wore on however this constant barrage of requests became really, really annoying. You could be quietly sleeping on the beach, face down or arm thrown over your eyes, listening to the sounds of the waves and conversation and laughter when someone would shake you out of your reverie and you would open your eyes to find someone who was offering to sell you a massage, or a sarong, or board shorts, or fake Baby-G watches. You could not walk down the street without someone trying to get your attention. The calls for “transport? Transport?” from men sitting on the curbs, their long black pants rolled up to their calves, shirts rolled up to expose their bellies, as they make a gesture like turning a steering wheel is what I remember as one of the biggest banes of Bali. I signed up for tours. 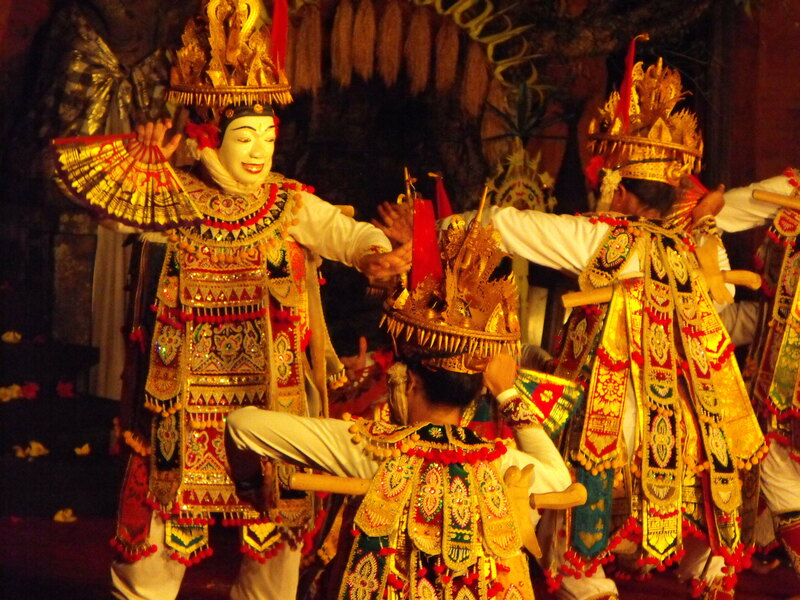 I visited Goa Gajah cave and temple with a stop to see a traditional Barong dance on the way. It was my first time to see the Barong and it launched a great interest in Balinese dance. I was joined on the tour by a German father and daughter, whom I am still in touch. I also went on the sunset tours to the beautiful Tanah Lot, a coastal temple that becomes inaccessible at high tide, and Uluwatu, which sits precariously on a high cliff in the far south and where as the sun set I watched my first Kecak dance. And completely unlike me, I joined three male backpackers from the guesthouse to dance my cares away at a local night club. Because every funeral should have it’s own t-shirts. A Perama shuttle bus took me from Kuta to the central Balinese town of Ubud. Still crowded with tourists it had a completely different vibe from the Spring Break party-like Kuta. It was rice paddies and artists, handicrafts and dance. I loved Ubud. I stayed another five days just there. During the day I strolled the streets, visiting the Monkey Forest full of the cheeky aggressive fellows who will rob you blind of food and water or dining on some of the best backpacker fare in Southeast Asia. I attended a cremation ceremony after the motorcycle taxi guy who transported me from the Perama shuttle station to my guesthouse showed up one day and invited me. Why not? I had never been to a cremation. I visited the Tegalalang rice terraces, a waterfall, and the Gunung Kawi temple. And every single night I purchased a 25 rupiah ticket (about US$2.50) to watch traditional Balinese dances at the Ubud palace. I saw Barong and Kris dance again (it’s a crowd favorite), the Kecak dance (different venue from the cliffs of Uluwatu), the Legong dance, the frog dance (tari kelod), and the entrancing butterfly dance (tari kupu), my absolute favorite. I am having a pretty good time here and am in no hurry to leave. Tonight I went to see my third performance of Balinese dance. They have all been great. I also attended a cremation ceremony today. A guy I met at the bus station showed up on my porch today and told me about it. I was immediately excited over the prospect of seeing a real ceremony, then though for a second…hey, this is a cremation, a funeral of someone I do not know. But there were hundreds of people there; easily there were 50 men carrying the platform on which sat the Papier-mâché bull inside which lies the body of the deceased. The pallbearers turn this way and that and around as the body is transported from the home of the deceased to the cremation site so that the spirit will be unable to find its way home again. At the site vendors sold ice cream and other snacks. From Ubud I traveled to the coastal town of Sanur to catch a bus to Java. I made it to Java! There was some doubt yesterday as to whether I might get here today. The day before I had been thrilled to get my bus ticket, it had been so easy, too easy. The bus was to pick me up at my Sanur hotel and drop me off in Malang – still a seven hour drive from Yogyakarta, but at least getting me off Bali and on to Java. It also had air-con and reclining seats. The cost was 85,000 rupiah. The pick-up time was to be 5:10 pm. Around 5:30 I was beginning to worry and called the office. They said there was some problem with the air conditioning and they would be along shortly. At 6 pm I called again and was told 30 minutes more. At 6:45 they said 15 minutes. At 7:10 they said the bus had to leave before 8 pm. I negotiated a 15% discount. At 8:45 pm I marched up to the office because phoning them seemed to do nothing to spur them to action. Around 9:10 me and my bags were ensconced aboard the bus and heading for Denpasar. I thought we would pick up the five other people at the station, but we picked up each person at their homes, usually at the end of a one lane, unpaved road, so that I, in the back of the bus was tossed around like a beach ball. Supposedly this bus adventure included dinner to be served around 1 am when we first crossed into Java. We rolled off the ferry from Bali at 4 am. At 6 am we arrived somewhere and the driver told us to have our dinner, er, breakfast. We arrived in Malang at 10:30 am, though we were supposed to arrive around 5 am. I stayed two days in Malang staying in the house of a sister of a woman I met randomly while in Sanur. I felt a bit weird about it at first but the family was extremely kind. On the evening of the second day I took a night bus to Yogya. Yogyakarta. I loved this place too. I had no idea at the time that I would return time and time again to Bali and to Yogya. 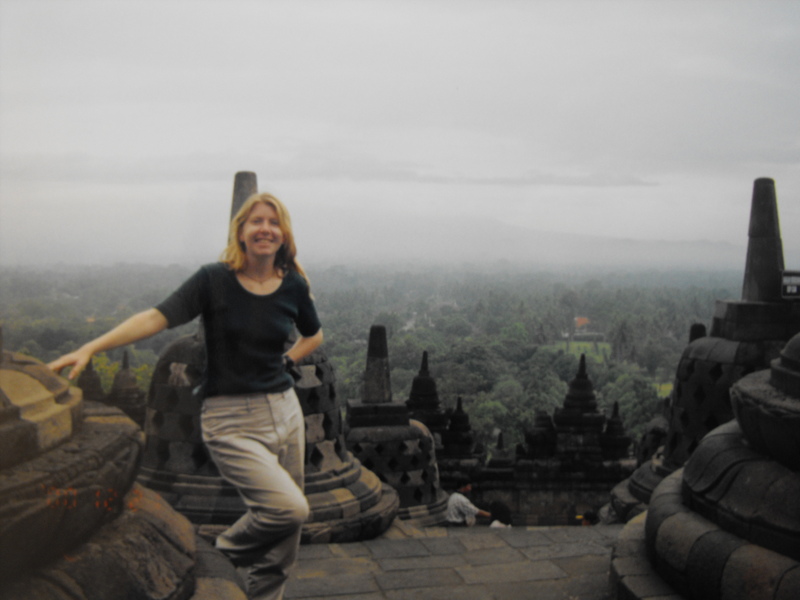 As any good backpacker would do I visited the Sultan’s palace in the city and the 9th century Mahayana Buddhist Temple of Borobudur, the world’s largest such Buddhist monument, and the 10th century hindu temple of Prambanan, both UNESCO World Heritage Sites. Both are also breathtaking. One evening in a hot un-air-conditioned school room, sitting on hard folded wooden chairs with only two other tourists, I watched an old chain-smoking puppet master perform a traditional shadow puppet play. On another evening I watched a Javanese-style performance of the Ramayana ballet. Then it was time to head back to Bali on a two day bus “tour” that stopped at the smoking volcano of Mt. Bromo along the way. What I remember most though was not the volcano or landscape but the hot and uncomfortably long ride in the bus, the too early wake-up call to head to the volcano that came after already being awakened by the call-to-prayer from a scratchy megaphone rigged to the mosque directly across from the hotel, and the unexpected morning chill before the sunrise. Mt. 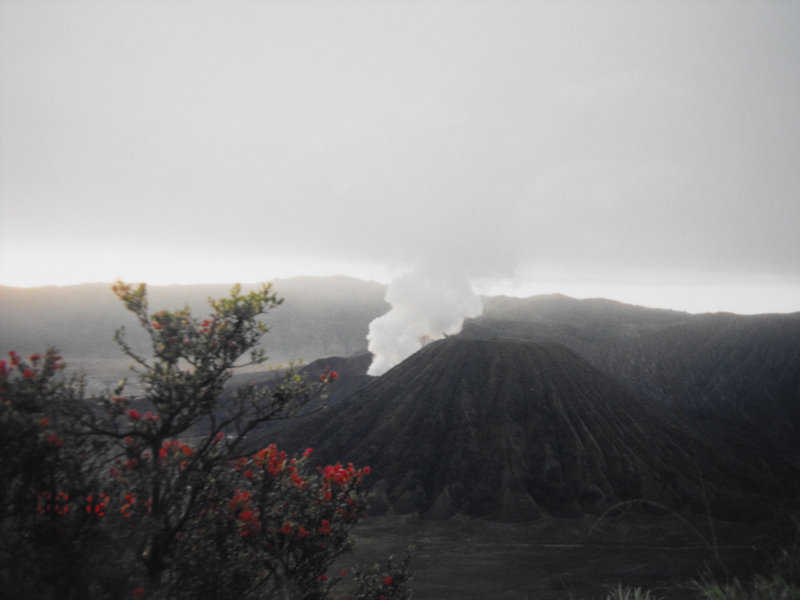 Bromo was incredible but we had only four hours there and many, many more hours on the bus. The bus was supposed to be air-conditioned and it was not. The driver and his bus were filthy. I was wearing white Taekwondo pants and at the end of the trip they were grey. Gas was leaking into the bus which smelled bad and was surely dangerous. The man at the hotel was a jerk. I would like to have spent a whole day or two at the volcano instead of arriving at 8 pm and waking up at 3 am to see the sunrise and leaving again by 8 am. Mt Bromo is still an active volcano, which right now is showing quite a bit of activity – it was smoking and yet we still climbed right up to the crater and peered in. 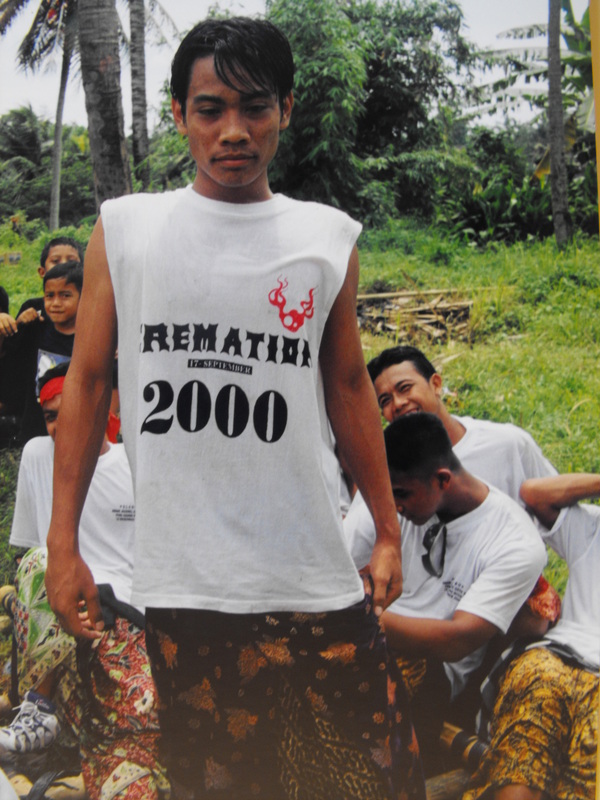 This entry was posted in Former Travelogues and tagged backpacking, Indonesia. Bookmark the permalink. Hi, Wanderer, here’s a Dutch linguistics author with a question. I’m in the home stretch of writing a book about 20 big languages, including Indonesian and Javanese, and I would really love to reproduce your ‘Yogyakarta street signs offer life advice’ photograph. Would you give permission for that? And if so, under what name should I give you credits? I hope you’ll be seeing this message in time! 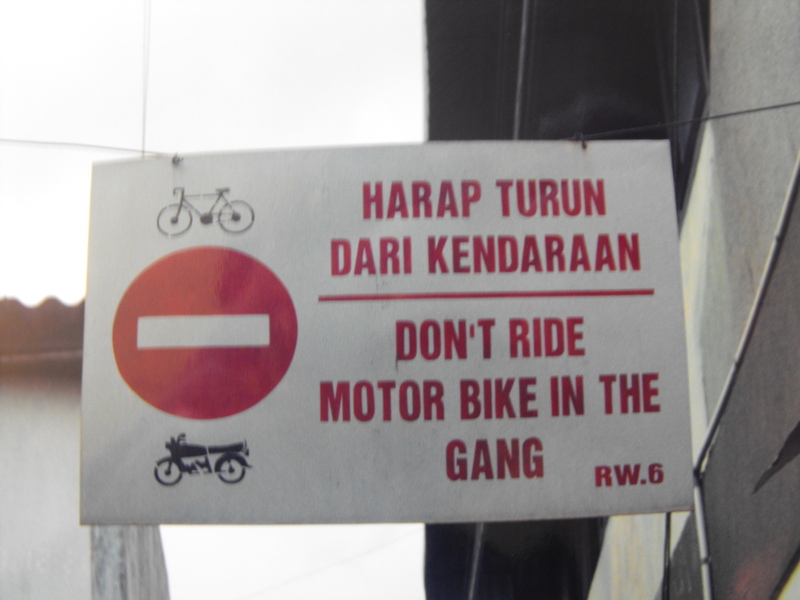 By the way, the Indonesian word ‘gang’ derives from the Dutch word ‘gang’, meaning passageway, which, somewhat incredibly, is a close relative of the English word ‘gang’.